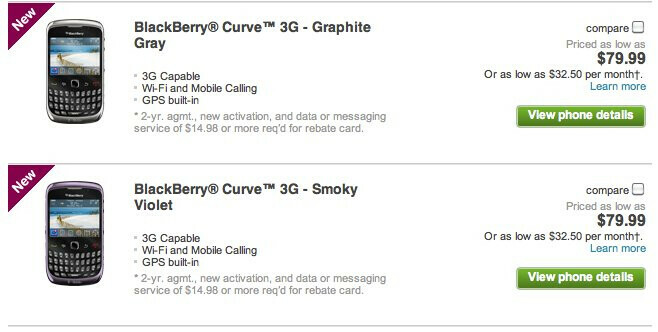 If you're a T-Mobile customer who happens to own a BlackBerry Curve 8520 and find its lack of 3G support somewhat worrisome, you're probably ecstatic to know that today is the big day for you – meaning that the BlackBerry Curve 3G is now available for purchase. Sure it's still sporting the last generation BlackBerry OS 5.0 platform, but the trade-off can be found with its low $79.99 on-contract price. Add in the fact that it'll provide for a faster data connection, whenever you're under T-Mobile's 3G network, it'll undoubtedly be seen as a good thing either way. Offered in either its Graphite Gray or Smoky Violet paint schemes, it retains that solid BlackBerry look and keyboard which should appease everyone moving up to it. Even though it might not offer the latest or even high-end specs, it should nonetheless still offer T-Mobile customers a decent solution without having to fork over big bucks.